First Tuesday of the month brought us over to the Columbus Senior Center this morning for our Senior Craft. We played around with the concept of Pointillism making pictures with dots of paint. Using stencils to guide and fingertips as applicators makes this a fun project that anyone can do. This stencil, fingertip, Pointillism project will be featured during Open Studio at The Workshop this week. Our Open Studio hours are Tuesday 6-9pm, Wednesday and Thursday 10am-5pm, Friday 9am-noon and 3-8pm, Saturday 9am-2pm, and Sunday 1-4pm. During Open Studio we have work space for artists and crafters. We also have supplies and tools for visitors to use. Cost is $5 for up to 2 hours and $1 for each additional hour. 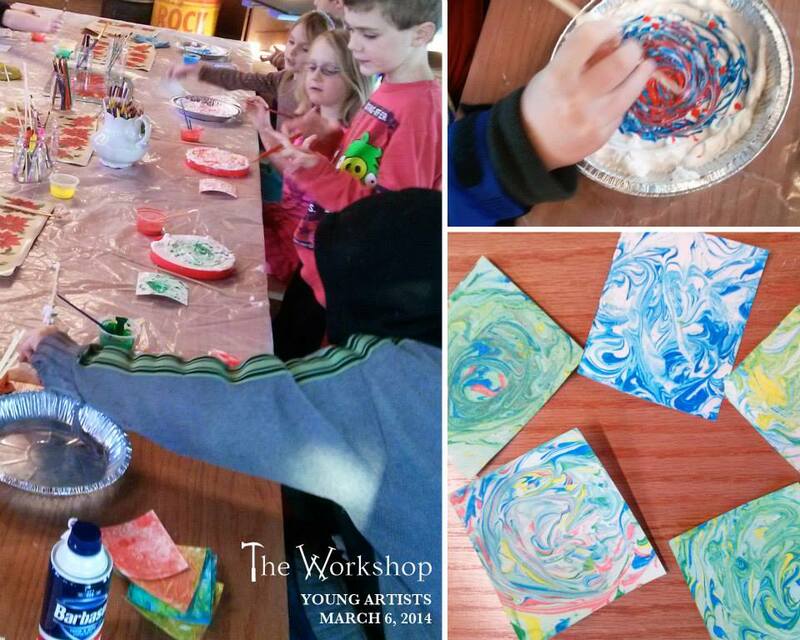 On Thursday, March 6th our Young Artists class begins. Instructor Kara Ginther will lead elementary and middle school aged children in exploring different techniques and creating interesting works of art. This class will have a strong focus on the creative process. Caregivers may drop off children or stay and relax in our lounge area. Cost is $12 per class / pay as you go or purchase a six-class pass for $60. To register, call 920-319-6956 or email workshopcolumbus@gmail.com. Saturday, March 8th is Teen Night at The Workshop. Come hang out and create some awesome art. Use supplies from our open art area, paint a canvas, or work with leather expert, Kara Ginther, on a one of a kind leather key tag or bracelet. Cost is $15 per person or 2 for $25, all supplies included. Registration not required.